When you sit on the throne of the Sovereign Self you are self-governing, powerful and move through the world with grace. You act in accordance with your Soul’s purpose and remember you are the author of your own life story. In order to connect with your expansiveness and authenticity you must have opportunities to step away from the demands and loves of daily living. Women thrive when they gift themselves time and space to breathe, to be surrounded by beauty and when they honor their creative voice. Gift yourself an inspiring weekend retreat this fall with Dawn Thompson at the charming and intimate Historic Balch Hotel located in the lush, golden hills of Oregon's Columbia River Gorge. *Prompted writing to dive deeper into meaning and reflection of your authentic truth. *Sharing story to enable your voice to be heard and valued. *Guided meditation to connect you deeply to your inner wisdom. *Time in nature as well as silence to hear the call of your spirt. Claire Sierra, co-owner of the hotel and author of The Magdalene Path, Awaken the Power of your Feminine Soul, will share from her experience as a writer and will take us through a guided meditation on Saturday evening. You can also enhance the luxurious feel of the weekend by booking a spa session with Claire before, during (limited slots) or after the retreat. Click here for more details. No writing experience necessary. For more information about PWW's writing methodology, visit us here. *The Balch hotel, located in the small town of Dufur, Oregon, in the Columbia River Gorge is less than 2 hours from Portland, but feels like a world away. There will be time during the retreat to explore Dufur and its surrounding areas, including White River Falls State Park. 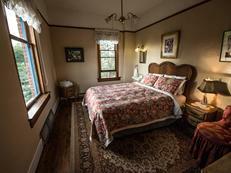 *Each participant delights in a "room of her own," featuring period antiques and a queen-size pillow-top mattress bed. This historic hotel has kept the tradition of a shared bathroom and shower down the hall, but there are enough that there is seldom any wait. 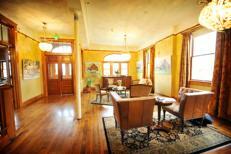 Participants can pay extra for a room with a bathroom of their own. *Enjoy the rare luxury of having delicious meals brought to you. 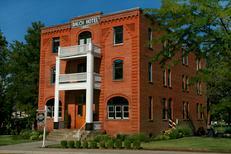 The Balch Hotel sources local and organic whenever possible and features natural products from their neighbor Azure Standard. Hotel staff are happy to accommodate special dietary needs. "I was drawn to the retreat to have space, time and shared writing in a circle of women...to get away. A lovely inn, quiet town with the regal presence of Mt Hood greeting me each time I went out the front door. I wasn't prepared to meet my sovereign self but when I did, what a glorious encounter! Now she is never far. I was lead through the experience with powerful but gentle facilitation by Dawn and the lovely support we held for each other in the circle." "I find that I do my best writing in a group, but also that the writing spark the retreat brings forth lasts for several weeks and many new works. I attribute this to Dawn's sculpting of time and space to allow us to really focus on our voice."